Home Motivation Fitness Story : Fighting Back Post Injuries! 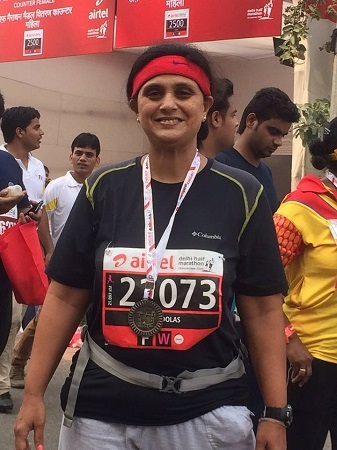 Me to myself, new rediscovery, new identity – Across the finishing line of SCMM half marathon. My fitness story goes back to 10 years from now, to the day when a leading gynecologist took me to the operation theatre for hystectomy in 2007. It was hard to imagine that I had to lose one organ like this so early in life! I had earned this doing day and night duties for 4 years as Deputy Commissioner, Mumbai International Airport! Enigma of glamour and bonus!!! Bonus – to take toll on one organ. But losing an organ was Enough! Truly enough! I promised myself to change the path – path of sweat and work – Panchamahabhuta (five ghosts!) whom I had forgotten in a lifestyle. I went on to take charge as Deputy Commissioner, Nasik. It began with early morning walk for an hour, breakfast, and then swim for 40 minutes. Nasik’s amazing climate proved boon. Nasik is the city of fresh vegetables. I adopted a simple Indian diet. Fenugreek or French bean vegetable and one ragi bhakari (Marathi roti), salad, fruits, buttermilk became my routine. I was once again promoted back to Mumbai. The city has a hectic vibrancy but by then I had become a fitness freak. After dropping my son to the school, my swimming regime continued and by now I had become an endurance swimmer. My swimming coach helped me to refine. I dedicated my weekends to long hours of fitness. That was the only time available then in hectic life. Results were astonishing. I cracked a Gold medal in breast stroke in Indian Revenue Sports Meet. Standing on the block waiting to dive, gunfire, take your mark…dive, compete, win, medal. I really discovered new life outside the routine of a government office. Wave of positivity, happiness and bliss started flowing..! In 2010, Bikram Hot Yoga studio came to Mumbai. I was now doing yoga with all foreign champion coaches. It was an amazing experience of doing yoga in 41degrees heat. But after 4 months, I rolled over in class, my spine became stiff due to heat and I had to be bed ridden. It was a case of a bad shoulder injury. I was asked to respect age…! My family asked me to completely stop all athletics. I could not swim even 4 laps. But after 3months I again went to class of Bikram yoga…Standing at the same place, where I was hospitalized I restarted hot yoga…And believe me, I was perfectly alright after 6 sessions! For the last many years I have been winning Medals at regional and national level in swimming. 4 years back I joined the group Be Fit at Juhu. I never thought I could run more than 2kms at stretch then. But Brinston, my coach made me run. I still remember, on my first half Marathon, Brinston was on the way, motivating his students..-looking in my eyes, he said,”Smita, you are completing it….”For, the promise and respect to my coach achieved medal! It is spiritual experience after some kilometers. One runs with the mind! All weekends reserved for long runs and swim. I am 49 years old today. Have run 7 half marathons and a dozen 10k runs. All this, despite two major operations. Diet (what you eat) is the most important part in fitness. Key to fitness is no shortcut or proxy. Depend a lot upon Yoga – It turned my silver medal turned to Gold. Hatha yoga gives flexibility and Ashtang Vinyasa help in neuro- muscular coordination. For sportsperson one has to control anxiety, especially before events- Yoga is the only solution then. Only air-conditioned gym membership cannot gift fitness. It is sun, water, mud. During the Corbett Marathon it was raining heavily, but we started with the gun and after one hour rain stopped, could see rainbow – rainbow of my dreams. I will never forget that muddy and rainy run. Man is born to sweat! Feel the tiger in you. We all are born to be fit. Smita is an officer with the Indian Revenue Service (1998). She is presently Additional Commissioner, Customs and Central Excise. She describes herself best as a poet by heart. She sways between writing poetry and, stories, is an avid reader of philosophy. She works heavily with children from the poorest sections of society. She travels to interact with the people around the world. Awesome, it’s truly unbelievable. U are an Inspiration for all those who wants to run despite of injuries. Hats off. Respect n honour for U. Great dedication on your part. May god bless u with lot of positive energy !!! So glad to kno abt u dear !!! Truly impressed not by this post but regular posts n pics of completing marathon. Smita ji is an example n inspiration for many including me. She is truly a fighter n very determined but golden by heart. My sincerest wishes for her n would love run with her one day. You are a real fighter, at 49 best of physique earned truly by disciplined routine and dedication. Inspiring story indeed! So glad you have taken inspiration from this one! Attractive section of content. I just stumbled upon your blog and in accession capital to say that I acquire in fact loved account your blog posts. Nice post. I was checking constantly this website and I am impressed! Extremely helpful info specifically the last part 🙂 I maintain such information a great deal. Very energetic blog, I enjoyed that a lot. Will there be described as a part 2? Your mode of describing all within this post is genuinely good, everyone can easily understand it, Thanks a good deal.